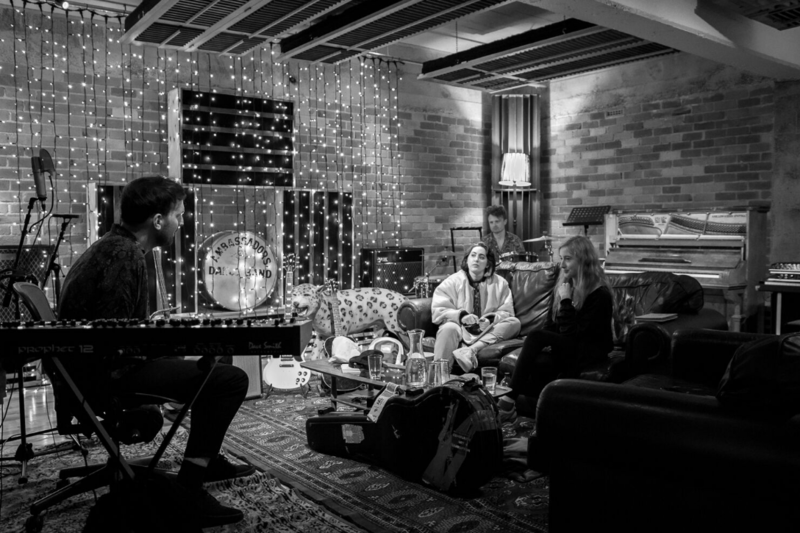 APRA AMCOS NZ just hosted SongHubs Auckland, an initiative which saw 18 songwriters from across the country and the ditch hed into Roundhead Studios for a week-long songwriting camp. It’s the 5th instalment of the collaborative event, where the writers are curated into groups of four to write a song a day. Past successes include Chelsea Jades ‘Pitch Dark’, Mitch James’ ‘All the Ways to Say Goodbye’, Maala’s ‘Kind of Love’ and Louis Bakers‘ ‘Addict’- all were written at past SongHubs. The event also brings four international writers to New Zealand’s shores to build creative relationships with local talent, and create a stronger connection between industry and the global music network. This year’s guests were Nate Campany, Maize Olinger, Justin Gray, and Jenna Andrews, who all took part in the public SongHubs seminar series – a conversation around songwriting and the changing industry. Ash Wallace from APRA AMCOS NZ shares 10 takeaways from SongHubs Auckland. Justin Gray asked an audience of songwriters how many songs they wrote a year- with the response being an overwhelming low number. His comparison between that of a songwriter and a professional athlete was particularly poignant, in that songwriters have to exercise their creativity by writing every day. Maize Olinger is comparatively new to songwriting alongside her international counterparts, which made her comments around self-doubt and imposter syndrome even more relatable to the songwriters in the room. Her advice to be kind to one’s self is incredibly essential for the modern artist, who when writing a song a day is bound to come across a creative drought and be hard on themselves. We cannot confirm or deny if Jenna Andrews stopped for a moment of peace throughout her entire week at SongHubs. The woman is a genius songwriter and a heck of a hard worker. Not only did she collaborate on many songs at SongHubs, but she took part in extra sessions with kiwi songwriters after hours, while simultaneously negotiating deals over the phone back to the US, and maintaining her work as an A&R consultant and all-round boss. Seeing her in action was a shocking reality check as to how hard you have to work to make it to that level. Nate Campany came into his sessions with high energy and a positive attitude. The generous team at Atomic Coffee took Nate through their Kingsland café and in house roastery, on a private ‘cupping’ and a full explanation of the roasting process. Nate later relayed the experience to the SongHubs group as ‘the best day of his life’, re-watched his own Instagram stories of the cupping about 1000 times, and made his love known publicly by wearing his Atomic Gang Tee for the next 24 hours. I think it’s safe to say – he’s a fan. “Don’t let ego overpower the energy in the room,” says Justin. Even the most successful songwriters should never feel superior or above anyone else who has come to a session. For Nate, even after writing hit songs for Dua Lipa, Carly Rae Jepson, and Tove Lo, “Those feelings never go away. On the last day of a songwriting camp, the songs are always better than those of the first because everyone has let go of all the ‘easy’ and moved on to the new. The more you write, the more you force yourself further into your creativity. Although you may leave a session feeling completely exhausted and emotionally drained, sometimes that best songs come from an environment riddled with tension and strain. Jenna Andrews recalled an artist she worked with leaving a session in tears after writing the song that became their biggest hit yet. Our musical culture in New Zealand, to hold on to our creativity and keep it for ourselves, is outdated and restrictive. Through the collaborative effort of this week, 20 songwriters had a life-changing experience that breathed new life into their songwriting and artistry.